If you’re looking for a Nerf Crossbow, then you’ll definitely want to consider things carefully. Nerf crossbows are known for being a bit ‘hit and miss’ – meaning some of them are amazing, whilst many others are.. well, they’re not. You need to make sure you do your research before you purchase one so that you’re not wasting your cash. There are a few crossbows and bow and arrows that I like and I’d recommend, which I’ll run through below. There’s also a few that I’d recommend you avoid, so don’t make any purchases before you’ve read everything! So, lets look at some of the best bows Nerf has to offer. Although the Nerf Rebelle line was pretty short lived, there’s one thing that we can be grateful to the Rebelle line for. The Nerf Rebelle Tribute bow is one of the better offerings from the Rebelle line. It has pretty much everything you could ask from a true bow. It’s really lightweight so unlike when you’re using a crossbow, you won’t feel clunky and weighed down when you’re using it. It’s extremely easy to load the Tribute, and you’ll get an extra arrow which you can easily store away too. It fires a pretty fast distances too – more than the majority of Nerf guns. Overall, this is an awesome choice if you’re looking for a lightweight bow and arrow. Aside from the packaging it’s not particularly ‘girly’ either, so you don’t need to be concerned if you’re giving this as a gift for a boy. The N Strike crossbows has never really gained as much popularity as everything else Nerf. But, that doesn’t mean that you should overlook them completely. The Stratobow takes on the more stereotypical bow look as opposed to being used as a crossbow. It’s actually highly underrated as a Nerf crossbow in my opinion. It’s got a really cool shooting mechanism. Unlike the crossbows where you’re just pulling a trigger, you actually fire the StratoBow like a real bow. By pulling back and releasing the strings, when you allow the bow to be released, you’re releasing the pressure and letting it fire. If you’re looking to replicate the feeling of using a real bow, then this is undoubtedly the best option for that. The Nerf Mega Thunderbow is known as being one of Nerf’s best bow and arrows ever. It can be a bit difficult to find nowadays, but that doesn’t mean you should ignore it completely – you can occasionally find some good deals on Amazon or eBay. It uses the same mechanism as the Stratobow to work, which is particularly impressive and works well. You have 4 different Nerf darts in the clip, each of which will be fired individually when you release the strings. Another of the better Nerf bows to be released is the N Strike Blazin Bow. 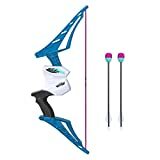 It comes with 1 arrow that you can fire, and two more arrows up top of the bow itself. This makes it really easy to reload, which is good for fast action. One thing about the Blazin Bow that separates it from pretty much every other Nerf bow is that it used a cool orange and black flame color scheme. I’m currently still waiting for Nerf to released another cool bow and arrow in the coming year (hopefully!). 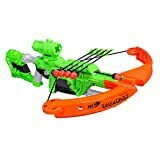 Now, let’s have a look at some of the crossbows that Nerf have released over the past few years. Crossbows can be a better option if you’re looking for a trigger action bow, but in my opinion, they do take away a little of the fun of using a bow and arrow. However, there are a lot of people who actually prefer using a crossbow as opposed to a bow and arrow. So, lets look at some of the better crossbows that have been released. The Dreadbolt is one of the best looking Nerf Crossbows, but practically and usability wise, it falls a little short in my opinion. Firstly, it’s absolutely massive, making it way to big to be practically worth using for me. Secondly, it gets jammed.. a lot. And thirdly, it’s just really difficult to load this crossbow. No one has this kind of patience to load this gun, I’m pretty sure of that. It does have a tactical rail on the top with a scope that you can use, but as with most Nerf scopes, this doesn’t really help with the usability of the bow itself. All in all, the bow does look really cool, but it’s not the best crossbow that Nerf have produced in my opinion. The Zombie Strike Wrathbolt is one of the best options currently if you’re looking for a low cost crossbow. Whilst I’m not a fan of the bright green coloring, this shouldn’t put you off the mechanics of the crossbow itself. It’s a much better option if you compare it to the Dreadbolt for a few reasons. Primarily, size wise its awesome for kids and adults – it isn’t too large. The firing action is infinitely better, too. Plus, it’s relatively cheap in comparison to other crossbows, so it’s definitely worth considering. The Crossbolt blaster is from the N Strike series, which has always been relatively underrated in comparison to other Nerf Series out there. It has a 12 dart clip, which is awesome for a crossbow, so if you’re looking for something with high capacity, this is it. It’s got a really good range of almost 100 feet, and for it’s power, it’s pretty small for a crossbow too. Overall, these are just some of the best Nerf crossbows that have been released over the past few years. Many of them have unfortunately been discontinued, but you will occasionally find them popping up in small retailers around the country. Otherwise, you can always find secondhand ones online or you may have to pay over the odds to a resellers (this is common with the most sought after bows). Depending on what style you’re looking for, you may be able to find something to suit you. Or, perhaps you might want to look at a regular Nerf gun or even a sniper instead. 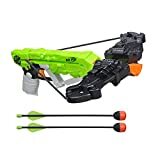 The good thing about Nerf is that they have a wide range of different guns and crossbows to choose from, so you’re likely to find something that you think is suitable.